Socio-Political-Journal... : BREAKUP OF THE WEST? By the time Air Force One started down the runaway at Naval Air Station Sigonella in Sicily, to bring President Trump home, the Atlantic had grown markedly wider than it was when he flew to Riyadh. In a Munich beer hall Sunday, Angela Merkel confirmed it. 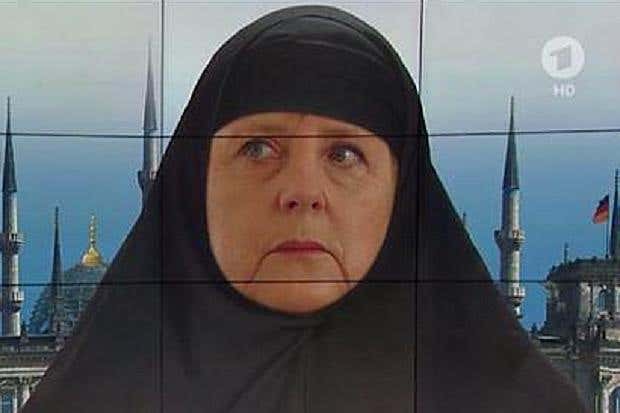 Merkel’s apprehensions are understandable. A divorce could be in the cards. During his visit to NATO in Brussels and the G-7 in Sicily, Trump, with both his words and body language, revealed his thinking on who are friends and who are freeloaders. Long before arriving, Trump had cheered Brexit, the British decision to quit the EU, and shown a preference for nationalist Marine Le Pen in the French election won handily by Emmanuel Macron. And where Trump was photographed by the Russians grinning broadly with Foreign Minister Sergey Lavrov, his confab with Merkel was marked by a seeming reluctance to shake hands. But the disagreements with Europe are deeper than matters of style. Trump and Secretary of State Rex Tillerson have indicated that in dealing with foreign nations, U.S. support for democratic norms and human rights will now take a back seat to strategic interests. In Riyadh, Trump signaled the Sunni king of Bahrain we will no longer be giving him instructions on how to treat his Shiite majority. We’re not “here to lecture,” Trump assured the Arab royals. After the conclave, the king’s police killed five and wounded dozens of demonstrators outside the home of a Shiite cleric, and arrested 286 of his supporters. Of greater concern to Trump and Tillerson is the retention of the Persian Gulf naval base of the U.S. 5th Fleet in Bahrain. Trump also tilts toward GOP skepticism of the threat of global warming and is considering pulling out of the Paris climate accord that is the altarpiece of the environmentalist international. In Brussels, Trump praised NATO’s decision to back the U.S. war in Afghanistan after 9/11, but did not specifically recommit to Article 5, requiring all NATO nations to treat an attack on one as an attack on all, which our nervous NATO allies had wanted to hear. Instead, they got an earful of pure Trump about how they owed back pay for NATO and that only five NATO nations were meeting their obligation to allocate 2 percent of GDP to defense. Merkel seemed to take this as an implied threat that the U.S commitment to defend Europe from a Russia with one-tenth of NATO-Europe’s GDP may be contingent and may have a time limit on it. Moreover, France, Britain and Germany appear far more solidly committed to the Iran nuclear deal than are Trump and Congress. A U.S.-NATO collision could come here, and soon. The Iranians have signed on to purchase 100 Airbus aircraft and 80 commercial airliners from Boeing. If the Republicans impose new sanctions on Iran, or scupper the Boeing deal, Europe would have to decide whether to abandon the Airbus sales, or deliver the planes and perhaps take over the Boeing contract. That could bring a crisis. And any U.S. confrontation with Iran, pressed upon us by Saudis, Israelis and Sunni Arabs could find Europeans bailing out wholesale on the next U.S. war in the Middle East. Trump also seems less committed to the sanctions on Russia for its reannexation of Ukraine and support of pro-Russian rebels in the Donbass than does NATO Europe or Congress. The European half of Trump’s trip should be taken as a fire-bell-in-the-night warning: Shape up, Europe, or you may find yourselves on your own when it comes to the defense of your continent. For we Americans have had about enough.